Currently, human activity is the primary driver of elevating atmospheric CO2, but the Earth fluctuated from greenhouse to icehouse conditions and back long before humans existed. The question is: what triggered these long-term climate cycles? Now research at the University of Sydney’s EarthByte Group, in collaboration with the German Research Centre for Geosciences, reveals how a supercontinent’s life cycle drives CO2 emissions and climate change over geological time. Their model is published today in the journal Nature Geoscience. With the help of computer simulations of supercontinent breakup and carbon cycle models supported by the Sydney Informatics Hub, the team uncovered how the gradual breaking up of continents triggers enhanced CO2 emissions through deep crustal fault systems. 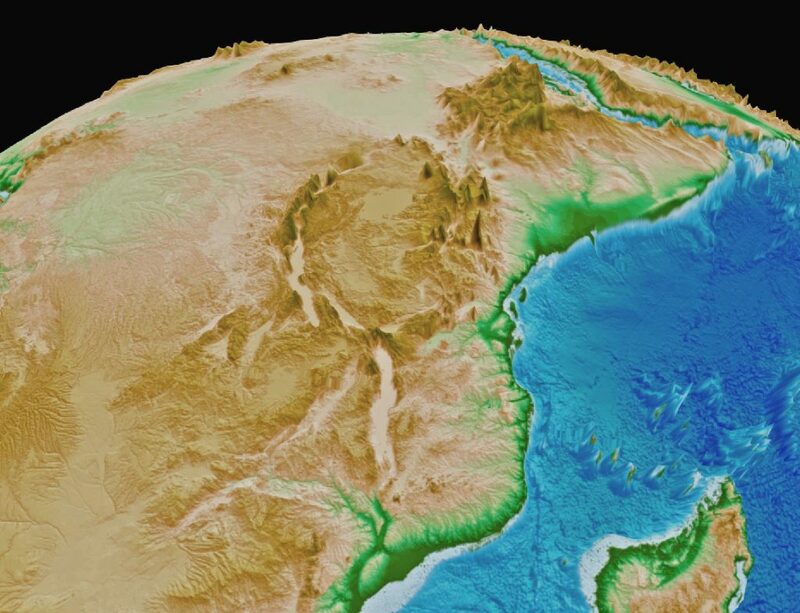 One of the best studied examples of the initiation of continental breakup is the East African Rift, a region near the horn of East Africa where the crust stretches and splits. The sampling of carbon dioxide seeping from the soils in this area has shown that this continental rift releases substantial amounts of CO2 into the atmosphere, mainly derived from the Earth’s deep mantle. The Australian-German research team used published field measurements of CO2 degassing along the East African rift zone to calibrate a model of carbon emissions during continental breakup. First, they built a digital model of all rifts that formed while the supercontinent Pangea started breaking up around 200 million years ago. Before the continents formed as we know them today, an extensive network of rift zones formed within Pangea. They looked like an interconnected system of zippers along where the crust was faulted and thinned before breaking completely. Next, the team used a global carbon cycle model to simulate the effect of CO2 emissions along Pangea’s rift systems through time. They found that two periods of extensive continental rifting from 160 to 100 million years ago and after 55 million years ago coincided with greenhouse climate episodes, during which atmospheric CO2 concentrations were more than three times higher than today. Professor Dietmar Müller said: “We have been able to demonstrate that continental fragmentation and long-term climate change is linked via massive CO2 degassing along crustal faults in rift systems. He said climate models of the geological past were used to understand better the possible future evolutionary paths of our planet. Professor Simon Ringer, who oversees the University of Sydney’s core research facilities, said: “This work reflects a new way of doing science, re-using published research data and software, and developing open-source community software to synthesise and model geodata in space and time. “Key elements to make this research possible are centralised computing and data science services via our Sydney Informatics Hub”. This research is supported by the Australian Research Council and industry-funded Basin Genesis Hub, which Professor Müller heads at the University of Sydney. The five-year project aims to improve our understanding of the evolution of sedimentary basins and continental margins by connecting multi-disciplinary data analysis and high-performance computing in an open-innovation framework. To view the continental breakup process in action, visit the Virtual Earth Laboratory (best viewed in Google Chrome), created by the EarthByte Group headquartered at the School of Geosciences. Here, you can play back the evolution of continental rift systems in four dimensions (3D space and time). You can also follow EarthByte’s research activities on Facebook and Twitter.